Performance and Reliability. IMC are renowned for quality, reliability and innovation, with an unrivalled reputation for customer service and support that gives you total peace of mind every time you choose an IMC product. 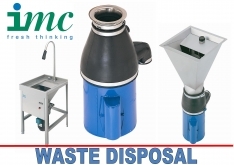 IMC food waste disposers are built to ensure a long operating life, with each unit being constructed from hygienic stainless steel to withstand continuous use in the most demanding of applications. IMC food waste disposers are compact and efficient, combining safety and ease of use with performance, functionality and reliability. In addition, our wide range of products and options enable each unit to be specified to meet your exact requirements. Features include operator safety interlocks, automatic water controls, low-load cut-outs for energy and water efficiency, as well as reversible motors that extend operating life still further. Accessories include: Water flow control, air break tanks, magnetic cutlery catcher, side panels (ring us).